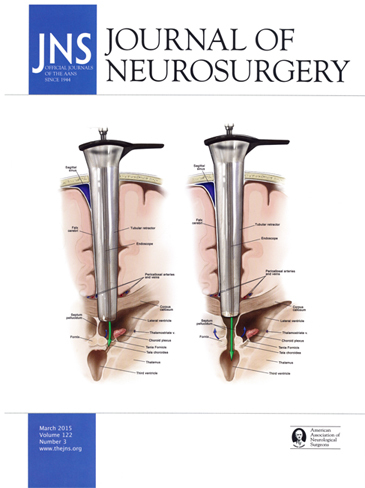 Our recent publication, A 3D Endoscopic Transtubular Transcallosal Approach to the Third Ventricle, is featured on this month’s cover of the Journal of Neurosurgery. OBJECT. Surgical approaches to deep-seated brain pathologies, specifically lesions of the third ventricle, have always been a challenge for neurosurgeons. In certain cases, the transcallosal approach remains the most suitable option for targeting lesions of the third ventricle, although retraction of the fornices and wall of the third ventricle have been associated with neuropsychological and hypothalamic deficits. The authors investigated the feasibility of an interhemispheric 3D endoscopic transcallosal approach through a minimally invasive tubular retractor system for the management of third ventricular lesions. METHODS. Three-dimensional endoscopic transtubular transcallosal approaches were performed on 5 preserved cadaveric heads (10 sides). A parasagittal bur hole was placed using neuronavigation, and a tubular retractor was inserted under direct endoscopic visualization. Following observation of the vascular structures, fenestration of the corpus callosum was performed and the retractor was advanced through the opening. Transforaminal, interforniceal, and transchoroidal modifications were all performed and evaluated by 3 surgeons. RESULTS. This approach provided enhanced visualization of the third ventricle and more stable retraction of corpus callosum and fornices. Bayonetted instruments were used through the retractor without difficulty, and the retractor applied rigid, constant, and equally distributed pressure on the corpus callosum. CONCLUSIONS. A transtubular approach to the third ventricle is feasible and facilitates blunt dissection of the corpus callosum that may minimize retraction injury. This technique also provides an added degree of safety by limiting the free range of instrumental movement. The combination of 3D endoscopic visualization with a clear plastic retractor facilitates safe and direct monitoring of the surgical corridor.